A couple years ago, Mike and I watched this TED talk by Stefan Sagmeister about the Power of Time Off. In his talk, he explains the importance of intentionally taking time away from paid work to reinvest in your own creativity. For Sagmeister, this means for every seven years of studio work, he takes a year-long sabbatical to work on creative projects that reset him. He has cited this time off as being the reason he has been able to continue to innovate and grow after years of client design work. In September 2013, we found ourselves in a difficult position. We had taken on a lot of design work that included a month of travel from one side of the world to the other. By the end of that month, I found myself suffering from severe anxiety and exhaustion. We had five full brand building clients, we were managing 5-8 freelancers and were posting original content on The Fresh Exchange daily. It was all too much. Our work was leading our life, our relationship was becoming stressed, and worst of all we were beginning to feel burnt out. As September was coming to an end we both returned to Traverse City, Mike from meetings in Detroit and me from a conference in Palm Springs, CA. It took us nearly a week to feel normal again before we were packing our entire lives into a moving truck in one night to move down to Raleigh. When we arrived in Raleigh, we quickly unpacked and got right back to work. It was a year of constant 5 am client phone calls due to servers going down, sleepless nights due to tight deadlines, and a lot of fighting between us. For the first time in my life, I found myself grinding my teeth at night and not dealing with stress as it piled up. We kept saying in that time, if we can just keep our heads up until Christmas, we will be okay. But when I fell short on a project for a friend and lost a contract for the first time in my career, I told Mike we would have to spend the holidays rethinking our lifestyle. All of this was happening in the moment and I didn’t know how to talk about it other than a couple ambiguous posts about stress here and there. Don’t get me wrong, it was a stressful time, but I don’t regret it at all. We had one of the best financial years of our company and we are so grateful we put the work in when we did. We loved our clients. They understood we were learning and growing thankfully! However, all the late nights and early mornings were at the expense of ourselves. Success is a wonderful and celebrated thing in our society, especially success that ends in accolades, financial gain, and a busy schedule. However after that year, we both realized that wasn’t the life we wanted to live forever. The biggest realization was that wasn’t where we felt success. During the 2013 holiday season, trying to release and let go of the stresses and projects that still were rippling into our life, I told Mike we HAD to take time off. Real time off. I wanted to run, and I hated opening my email every morning, which is not a good sign. I felt so disconnected from what I was creating, who I wanted to be, and who I wanted to be in five years. That was where I found myself as I entered 2014. The reason I tell you all of this now is not that I didn’t want to share it in the moment, I just didn’t know how to communicate it in the moment. Things need time, space, and long talks to work themselves out. Our intention in 2014 was to slow down, do less, preserve ourselves more, and purchase a home. We did some of that, but we also had a lot of stress still present in our lives. 2014 was another year of growth, pruning, hardship, learning, and more. It was a humbling year and one we are so thankful existed in our life. We did a better job not repeating all of the mistakes of 2013, and for the first time had actually planned on taking a purposeful slowdown time. We rented a summer house in Traverse City and didn’t start any new projects over the summer. We knew we had some client work in the area and it seemed like a good excuse to beat the heat of Raleigh and head back north. Unfortunately, just as 2014 was quickly shaping up to be, that summer was a quick dip into some hard lessons. We always enjoy our time up north, but it was anything but relaxing. Our plan was to spend time with friends and family getting back to a relaxed state, but instead got sucked back into phone calls, meetings, trying to keep up with client demands, and family pressures. It wasn’t easy. I hate to sound as if I am complaining here because we felt lucky to find ourselves in one of prettiest places in the country, but it wasn’t the break we needed. We simply had no clear boundaries of work and life and it resulted in the most stressful summer we have ever had.Lesson learned. We showed the pretty pieces of it all mostly out of a desire to escape the stress we felt, which unfortunately, created a disconnect between what was happening in real life versus on social. I shut out the hard things because I thought no one wanted to hear about it and honestly I didn’t know how I could share it all in such a public way. When you own a business of any kind, there is no way to miss out on learning hard lessons. It’s part of the adventure of it all. Sometimes those lessons come in small drizzles and other times they come in a downpour. 2014 was a downpour. We hired, we fired, we learned hard lessons about relationships, we took too many clients again, we felt the loneliest we have ever felt, we lost confidence in our work (especially me), and for the first time we saw how quickly money can be spent with growth. But again, you didn’t read about those stories in the moment they were happening because it just wasn’t clear how to write them without being crass. 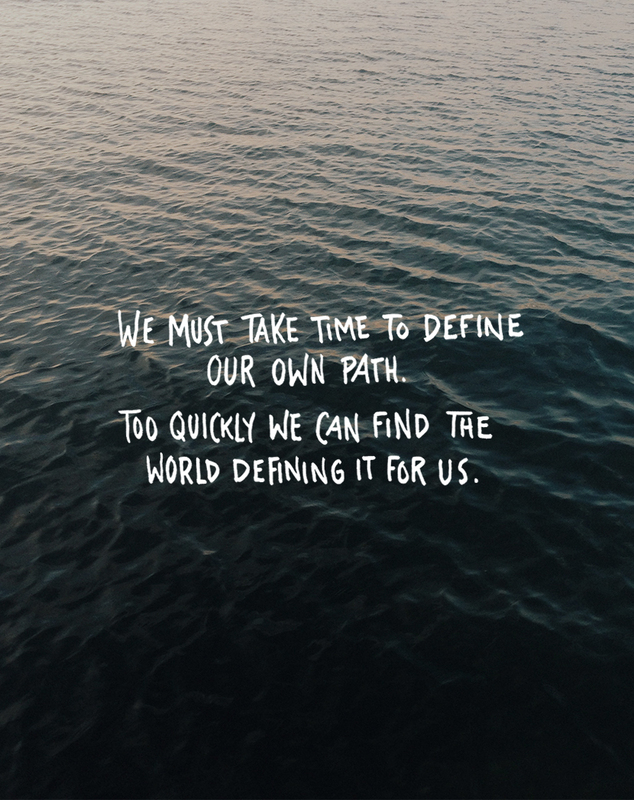 We were too deep in the moment and we needed time to have clarity and perspective. We were just too raw to write about it then. It was at that moment we chose to go to counseling. After long talks with a good friend and business advisor, we decided to meet with a counselor weekly to help gain some perspective on all that the last few years of work and life had dealt. It was hard to admit we couldn’t just get through it on our own, but in the beginning of 2015 we decided it was the year of going deeper, letting go, and choosing our well-being above anything else. So for the last seven months we have been meeting with a counselor weekly together, and it has been quite a journey. A journey that at times has been hard, but one I feel as we come to the eighth month of the year has been really beautiful and all about maturing. I tell Mike each week as we walk out of counseling, that it is the best money we spent all week (I plan to share more about that in the coming months). What came out of a rough year, was a new chapter for us. Part of that new chapter was, for the first time in our careers, actively choosing to take six weeks in Michigan just for us and really setting proper boundaries to make it happen. These six weeks are about us choosing to reinvest in ourselves. This is a true creative sabbatical. Yes, we are excited to catch up with friends and enjoy our favorite things about this area, but we are here for a much bigger reason. Northern Michigan is a place I have always felt free, and now after many years Mike does too. This place feels safe for our creative minds. Last year, we were in the heart of Traverse City, and this year we are hiding away in the sleepy town away from the tourist noise. We needed a place where we had space to dream, wake up slowly, be steps from the water, and see the stars at night. It isn’t much to ask, but after our hectic summer last year we felt a change of scenery wasn’t a bad thing for this summer. With the noise of the last two years finally subsiding, we are truly spending our days boating, relaxing by the water, and farm markets, and this year it is on purpose. These are the places we are destressing, finding clarity, and rejuvenating our creative minds. We spent the last year and a half learning to find balance in our work and asking hard questions in order to find peace this summer. It took a lot of work to figure out how to take six weeks away from client work. We work for ourselves, and sure we are doing a sponsored post here and there but we literally closed client projects the week after the 4th of July and don’t plan to reopen the doors till we return mid-September. That’s a tough thing for anyone who doesn’t have a consistent paycheck. However, our hope is that this purposeful time away leads to better work, which eventually makes the trip profitable on the other side in more ways than just in dollar signs. It could be seen as a backwards perspective to actively choose not to make money for a period of time, but for us we know this is where the next steps in our careers will be realized and confidence found. We aren’t in a place where we can to take a year off, but one or two or more of these times away will preserve and cultivate a healthy creative vision for our lives, which is our greatest goal and mark of success. This means we will have to actively choose to have times where we make less income, live more frugally, and are smarter with what we have. Our time here has a simple purpose, to recenter ourselves, look to the future, and remember why we began. A friend said he takes 2 weeks of vacation, the first week to actually slow down enough to enjoy the second week of actual vacation. That has stuck with us and why we are valuing this 6 weeks with everything we have. This time is a release and reflection of where the last few years have taken us, what we see ahead, how to adapt and grow in a smart way, and most importantly ask ourselves what we really want in life. These conversations happen while driving to a favorite hiking spot, walking the boardwalk on the river, while wandering the beach at sunset, and spending a weekend on the sailboat. The conversations happen in places we feel the safest to release our deepest fears, weirdest thoughts, and biggest dreams. We all know where we feel a sense of freedom and safety and for us that is here. After such a challenging year, it feels good to be here, to be with old friends, to be among the place that always will feel like home and next to the water that never stops being the strongest craving in our souls. So, I want you to know all this so you know why we are here, why we are sailing, why we stepped away from our studio, why we are watching a sunset. We are actively choosing to walk away from our regular paycheck to preserve what is our greatest asset; our well-being and creativity. We have chosen the place many great writers, painters, and creative people have also chosen as their sanctuary. There is a reason Thoreau went to the woods and Hemingway spent many summers fishing the lakes up here. It is scary to walk away from what is safe and secure no matter where you are at in life, but the one thing I know is that in all the times I have failed, the times I took away from it all have always been where my greatest successes came from. I hope our time here begins to show in our work and what you read here everyday, I hope you hear our honesty and authenticity finding room to speak louder than we have felt it could in the past. I have never been more inspired to write again than I am here. Your positive words and support mean more than we can express. Thank you for reading and believing in us. Have a wonderful weekend!